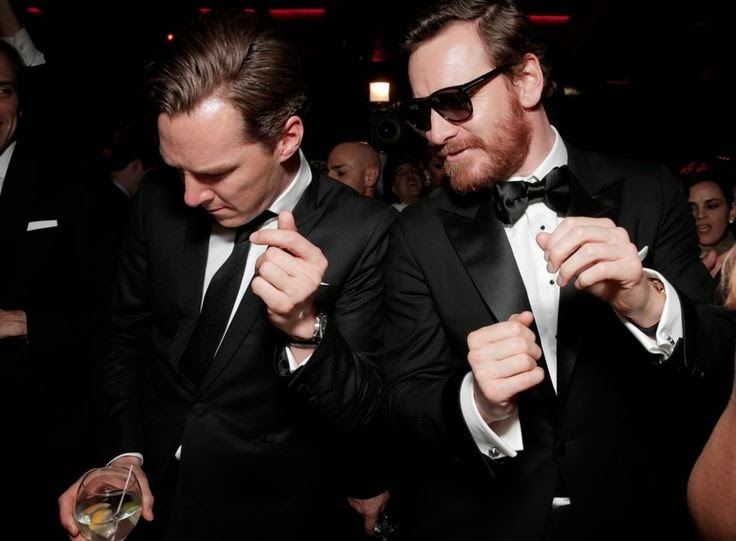 This is one of my favorite pictures from Sunday night, two of the hottest actors right now, Michael Fassbender hanging out again with Benedict Cumberbatch. These two need a movie with just them in it! If you're interested, please read my final thoughts on the Golden Globes at my Zen blog. The chat room was a nice success Sunday night as it proved to be a good investment to allow double the amount of people to chat. The next awards chat opportunity will come this Sunday for the SAGs. Please review the Upcoming Award schedule at the top of the sidebar to see when we'll have the chat open. I think it's safe to assume that Michael will attend the SAG awards because it comes just days after the Oscar nominations on Thursday. So he'll need to make himself available for interviews and such after his highly expected nomination. I may go into work a half-hour later just so that I can concentrate and devote time to write up on the Oscar nominations. So be here at 8:40 a.m. EST, January 16th in the chat room to partake in the celebration of Michael's overdue Oscar nomination recognition. Fingers crossed! In regards to those Star Wars rumors about Michael being in talks to be in the next series of this fan favorite series. Talks are just that, talks and we don't know more than that. A lot of actor's names have been dropped in articles about J.J. Abrams' production of the new Star Wars movies. I personally hope the rumors are just that, rumors because Michael will literally be walking into a brand new galaxy with the whole Star Wars thing and I just think his talents could be put to better use with the type of film roles we've all come to enjoy in his 10-year career thus far. If Michael's interested in branching off into something new, I'd rather see him back on TV in a nice mini-series or one of those three episodes deal on a hot show like how Benedict does with Sherlock.